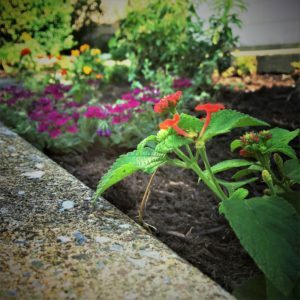 When I moved to the City of Bethlehem from the suburbs, I needed to find a garden. Little did I know it would lead to starting the newest community garden on the block. Jennifer had already got me in on the ground floor of CoWork 414. Next, she welcomed me to dig up the dirt in the back “yard.” Presented as a way to help – it is truly a gift. So I figured I’d try out urban gardening. Growing plants, especially edible ones, seemed tricky in the hustle and bustle of the city. But I do enjoy harvesting lunch between client calls. We walked to a patch of weeds. Small, though, just two manageable beds and a Japanese holly bush already took up most of the one on the left. Among Jennifer, Gary, Donna and me … we predicted to be done within a week. But “done” is not part of any gardener’s growing vocabulary. A garden is a work in progress. It started in the middle of summer. The heat wave enticed me to the air-conditioned office, but one afternoon, before our 4th Friday Celebration, some of us couldn’t resist the outdoors. The soil is so easy to work with here. Weeds wiggled out effortlessly after one of our many thunderstorms. Jennifer and Donna got their hands dirty, too. We discovered that the bed on the right buried tree roots. Surprise! I didn’t dare touch them. In a battle between a human and a tree, the tree usually wins. But with Jennifer’s tug on a trowel and stomp on a spade, she lifted them right out. That we did. Then came another thunderstorm. More weeds. And over the weekend, more gifts. Variegated Pesto Perpetuo Basil. 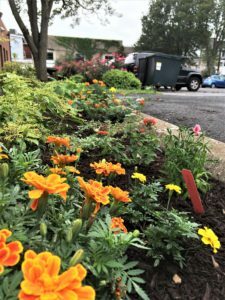 Thanks to Neighbors Home and Garden Center in Hellertown! Jennifer and Gary sourced some really interesting shrubs and herbs, ones I hadn’t ever noticed in the local nurseries. 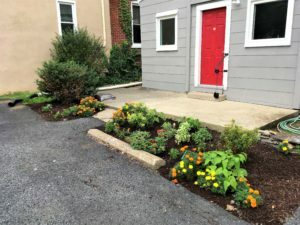 Two shrubs, Blue Baron Rhododendron and Valley Rose Pieris, and a new variety of basil for all of us – Pesto Perpetuo, which is both beautiful and edible. Sweet Lemon Mint, oregano and sage top off the collection. With all these plants on hand, we experimented with the layout. The herbs would circle around the two shrubs … and flowers were already part of the conversation, of course. Hot pink roses and petunias over at the bank next door called for color. Another pesky thunderstorm loomed overhead. For a few days, we weren’t quite ready to get the plants in the ground. We carried them up and down the stairs to CoWork 414’s porch, where they basked in plenty of sun and awaited their return to the soil. “Leave it to me,” I said. Marigolds, and more margiolds. Thanks to Pharos Garden Center in Bethlehem! I called up Ray at Pharo Garden Center. 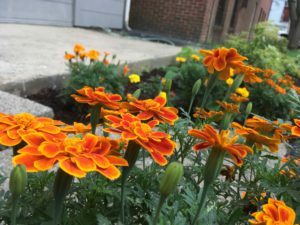 A flat of marigolds – reserved. Bright and early, I flew to Pharo. “Where are you gardening today?” he asked. As Ray knows all too well, I have four gardens: my window, the courtyard behind my apartment, a plot of vegetables at the NCC East 40 Community Garden … and now a landscaping task at CoWork! And so Pharos sold CoWork 414 their last flat of marigolds. One more walk around the nursery, and I pick up a purple verbena and two orange lantana. During the marigold run, Gary was off gathering a bucket-full at Bethlehem Compost Center. Our flowers returned home to a spread of compost – yum. The garden was as close to “done” as it could get. We watered the plants (and ourselves) and toasted “cheers” to a successful plot. 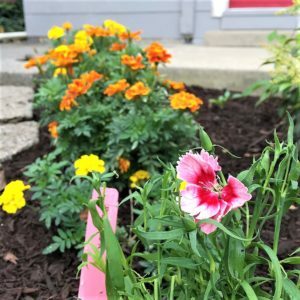 Thanks, GrowIt, for the dianthus samples! 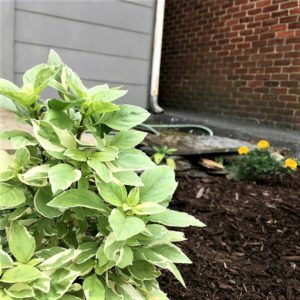 But wait, we need mulch (and more flowers). My apartment buzzer rang on cue. GrowIt Mobile gifted me these samples of pink dianthus, all boxed up and ready to go. It was like Christmas morning in the Christmas City. I scrolled through the app. Dianthus need lots of sun. With a few minutes to spare, I thought, I’ll just pop them in at CoWork. Lantana and verbena spill over our parking lot bumper. Thanks to Pharos Garden Center! 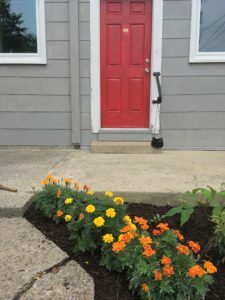 Now, the marigolds line our entranceway, up to the red door, and create a striking contrast of orange and yellow with the pink blooms in the background. More edible plants have joined the herbs outside. Jennifer sprouted basil in a red bowl, which served as a centerpiece in our conference room and now rests among the sage and pesto perpetuo. 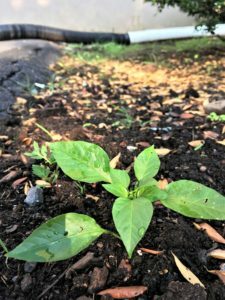 A chili pepper braves Autumn. In the front of our humble space, verbena and lantana spill over a parking lot bumper. Turns out urban gardening is pretty easy. I love this spot. We took a barrier and gave it a purpose. I’ve learned that cultivating a space, whether in the city or the country, means using the resources available in the most productive and creative way possible. Together, that’s what we do at CoWork 414. 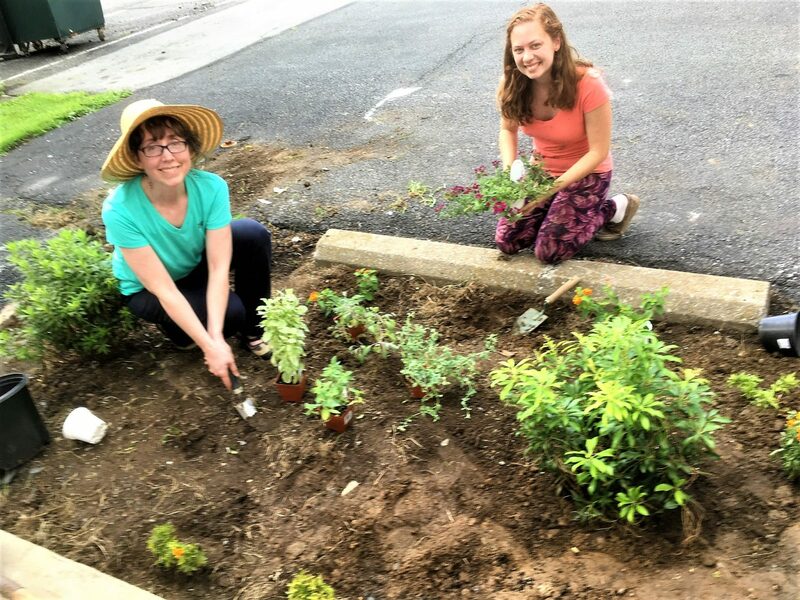 Bethlehem’s newest community garden on the block is “complete.” Come check it out! Want to be part of it all? Click here. Your articles are always an inspiration. When I add colorful flowers to my salads, sometimes I can get my neighbors to join me, but most times the answer is “no thanks”. I just smile and tell then that’s okay, maybe one day they will join me.